After Scotland failed miserably to end their wait for a first win over the All Blacks, now it is the turn of Ireland to try to make history. The Irish have taken on the All Blacks 23 times in total, and all but one of those games ended in defeat. Their one success story came in 1973 when a side featuring legendary figures such as Tom Kiernan, Mike Gibson, Willie John McBride and Fergus Slattery earned themselves a 10-10 draw with the Kiwis at Lansdowne Road. Since then, the All Blacks have reigned supreme. Ireland gave the New Zealanders an almighty fright in Dunedin in 1992 only to come out on the wrong end of a 24-21 scoreline, and they raced into a 21-7 lead at Lansdowne Road in 2001 before capitulating in the final half hour, allowing the Kiwis to ultimately cruise to a 40-29 victory. However, while Ireland have often proved competitive, New Zealand have generally won this fixture quite comfortably, with their most recent clash being a case in point. Ireland managed four tries in New Plymouth earlier this year but still ended up losing by 38 points (66-28). There were mitigating circumstances, in that Jamie Heaslip was dismissed after just 15 minutes of play, but it would be a surprise, even with 15 men for the entire duration of the game, if the struggling Irish belatedly registered their first win over the All Blacks this weekend. Ireland v New Zealand All-time record: Played: 23, Ireland won 0, New Zealand won 22, drawn 1. Biggest winning margin: Ire: N/A; NZ: 53, 59-6 at Athletic Park, 1992. Highest score: Ire: 29 (29-40) at Lansdowne Road, 2001; NZ: 66 (66-28) at Yarrow Stadium, 2010. Most tries: Ire: 4 (28-66) at Yarrow Stadium, 2010; NZ: 11 (59-6) at Athletic Park, 1992. Longest winning sequence: Ire: N/A; NZ: 17 (1974-present). Most points (individual): Ire: Ronan O'Gara 38; NZ: Andrew Mehrtens 81. 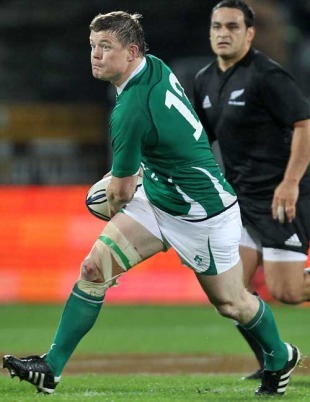 Most tries (individual): Ire: 2 Brian O'Driscoll, Keith Wood and Vince Cunningham; NZ: 5 Doug Howlett and Frank Bunce. Most points in a Test: Ire: 14 David Humphreys at Lansdowne Road, 2001; NZ: 33 Andrew Mehrtens at Lansdowne Road, 1997.